All scholars regular or private or open board coming under Punjab School Education Board (PSEB) are hereby invited for the Matriculation | Senior Secondary March-July 2019 Exams including Reap/Supplementary Compartment/DIC/Additional Subject/Improvement etc through the online- application form filling process. Students of Class 10th or 12th belonging to full-time study courses won’t have to worry about making an online enrollment or registration but those who have chosen for doing it Correspondance/Pvt. (Part-time)/state open school (SOS) will definitely need to get it done by themselves or with the help of their supporting Institute/Center. Candidates succeeding in the Board’s Public Exams engagement would be assigned with PSEB Roll No 2019. A Roll Number that is going to be issued will be formed with essential information like student’s name, father’s name, exam schedule, center’s name etc. Every school must have been provided with a Unique ID, Password using which a responsible person, probably the principal of the respective school can take out the Punjab Board Admit Cards after it’s been published on the official website www.pseb.ac.in. Before the roll number of participants go live, PSEB shall be releasing the separate Date-Sheet for Matric, Sr. Secondary Classes Annual Exams. Applicants may download it or can get it from the concerned teacher available at their school. Punjab Board is making necessary arrangements for the district wise and school wise conduct of main exams throughout the state. And Individuals must be able to check the full-fledged schedule later around a month preceding to the first paper. In the Academic Year (2018-19), combining all X, XII Class (Commerce, Science, Arts, Agriculture, Technical, and Vocational Streams), more than a million of students are set about to compete zealously. Prior to carrying out the examinations, PSEB would be publishing a nominal list on the basis of which roll numbers will be allocated to the Reg, Pvt, Open Board candidates. Further information like Room Number (Hall Ticket No) etc. would be confirmed after reaching the dedicated venue. 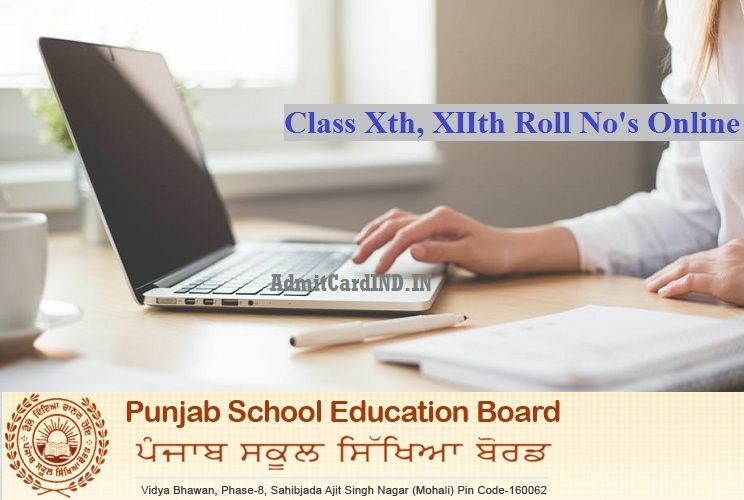 Writing here that Punjab Board Xth, XIIth Admit Cards are going to be made downloadable in the near future at the PSEB’s web page. Keep your Reg. No, Enrollment ID’s ready with you to access it in an immediate manner. Like it’s been mentioned earlier, an admit card is more like a permission letter and no one can be permitted in the examination hall without this meaningful document. Therefore, it will be advised to take care of it at least and until you are done with your last examination. Directly enter the links that are given below for obtaining Admit Cards. Choose your Subject and search your hall ticket by name, school etc. ways. After this, hover over to the submit option and press enter. Your roll no slip must be there for procurement. Bhai I’m Sunil singh. nominal rolls, exam center list aa Chuki h? Roll number late ni ho Gaye friends. Sir, I request you to please release my roll number. I am waiting for it.i am so excited to give board exam but before issue, the roll number and also, released the exam center. Punjabi exam date same hai? Roll No came or not? How to identify this? 10th class Roll No Came? Available for Private Reap/compartment Now. Which one do you need?